Model 5400/5410 Deluxe Mill - Millhill Supplies Ltd. The deluxe 5400-series mill is our most popular mill. It comes equipped with all of Sherline’s standard features upgraded to include a laser engraved 12″ (305mm) solid aluminum base for 2″ or additional Y-axis travel, laser engraved scales on the table and base, 2-1/2″ (63mm) adjustable “zero” handwheel on the Z-axis and 2″ (51mm) adjustable “zero” handwheels on the X- and Y-axes, a mill headstock spacer (P/N 1297) to provide more throat distance and a 1/4″ drill chuck and drawbolt (P/N 3072). An additional $80 worth of accessories plus 2″ more Y-axis travel and the convenience of laser engraved reference scales make the additional $100.00 over the cost of a basic Model 5000/5100 a very good buy. The 5400/5410 mill can be ordered with P/N 8100 digital readout already installed. Standard handwheels are not included because they are replaced by the DRO handwheels. 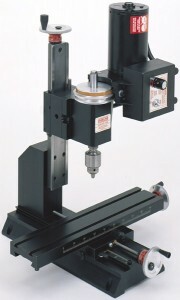 The mill can also be ordered in “CNC ready” configuration ready for the application of stepper motors and CNC controls. In this configuration the standard handwheels are supplied so that they can be used on the rear shaft of a dual shaft stepper motor for optional manual control.